In sales, availability is everything. Having just a few extra minutes open in the day may enable sales reps to follow up faster with that new lead. Or to check in again on that in-progress opportunity. Or touch base with that important client who’s up for renewal next month. Or make one more call to that cold contact. In other words, finding a way to give your sales staff a few more minutes might just be the smartest way to help them find a way to bring in more new business, more renewals, and more money. Of course, all those minutes don’t just grow on trees — is there really a way you can give your team that time back without cutting other essential activities? Well, if your organization still relies on in-classroom employee training for your sales staff, then likely the answer is “Yes”. Supplementing or replacing traditional in-classroom training with e-Learning solutions like video training is a tested and proven means to scale employee learning and development, reduce the overall cost of employee training programs, and give your team members back more of their time that they can spend selling. 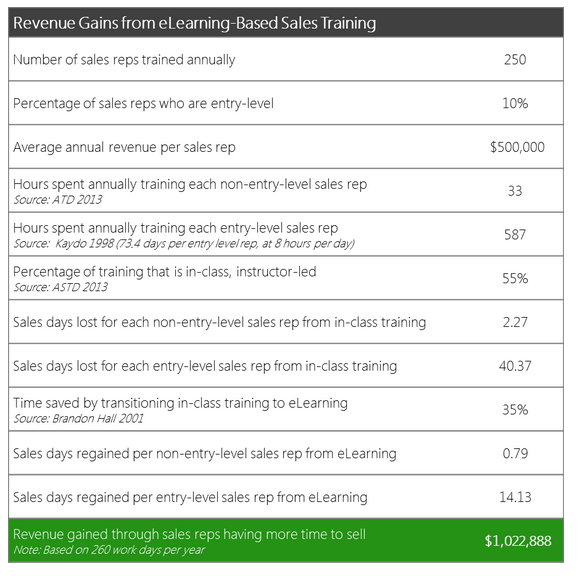 For this sales organization, supplementing or replacing traditional sales training with e-Learning video can help you realize more than a million dollars in annual revenue — and without adding new staff or reducing the amount of training you provide. Even small organizations find positive ROIs quickly with e-Learning, and for larger corporations, those revenue gains can quickly make their way to the bottom line. supporting sales training with video? Who’s Already Demonstrating the ROI of Video in Sales Training? Ernst & Young cut training time 52% and costs 35% by shifting to e-Learning. The company condensed 2,900 hours of in-class training into 700 hours of web-based learning, 200 hours of distance learning and 500 hours of classroom instruction. Dow Chemical cut its average spending of $95 per learner per course on in-class training, to only $11 with electronic delivery, yielding an annual saving of $34 million. Oracle has also seen benefits — fully $10 million in cost savings — by using on-demand video to power sales kickoff meetings, rather than investing the time and effort to stage an annual in-person event for its entire international sales force. Caterpillar found that e-Learning yielded a cost reduction of between 40—78% based on the size of the audience. Across industries, across geographies, across products and markets and more — introducing video has proven an effective means of scaling learning and development and improving employee training. For organizations everywhere, training with video has become a surefire way to give sales teams the training they need — plus a little more time for work, too. What Does Video Sales Training Look Like? One of the most valuable aspects of video sales training is its flexibility — video can be an effective means to share anything from simple onboarding information to complex technical product details. As an example of how an organization might use video for training, take a look at this new sales staff training video. If you’re looking to create an effective sales enablement program, download our free white paper, Break Through: Boost Sales Enablement with Video. In it, we discuss 18 ways you can use video to enhance the way your organization does sales enablement. If you’re ready to try video for sales enablement at your company, contact our team for a free, full-featured 30-day trial of our video platform.